While walking is a proven aerobic exercise to improve your fitness, increasing the challenge of your foot workout by climbing up stairs -- either real or on a machine at the gym -- burns more calories and strengthens your lower body. Muscle soreness after a healthy stair climb often occurs as a result of your body’s response to the increased challenge, although in some cases the discomfort indicates a muscle strain. Recognize the benefits of stair climbing and the likely cause for your soreness in order to improve your well-being. Trainers often recommend stair climbing as a vigorous method of aerobic exercise that offers multiple health benefits. Harvard Medical School reports that climbing gives you an ideal way to burn away unwanted fat -- since skipping the elevator for the stairs allows you to use calories up to three times faster than walking on a normal surface. Stair climbing is also aerobic, which means the workout rewards your body with a stronger heart and immune system, as well as a lowered risk for cancer and heart attack. People who start a new exercise technique -- such as upgrading a daily walk to a more intense stair climbing session -- often experience initial muscle soreness that fades as the body becomes comfortable with the increased activity. New exercise methods typically require your body to use a different set of muscles. The new muscle use causes a condition called delayed-onset muscle soreness that occurs between 12 and 48 hours after your workout. The soreness is the result of minor tearing and bleeding in your muscle fibers that is necessary for your muscles to strengthen and adapt to an enhanced state of function. Although a massage often reduces soreness, your best remedy is to continue exercising at moderate pace after giving your legs at least two days of rest. 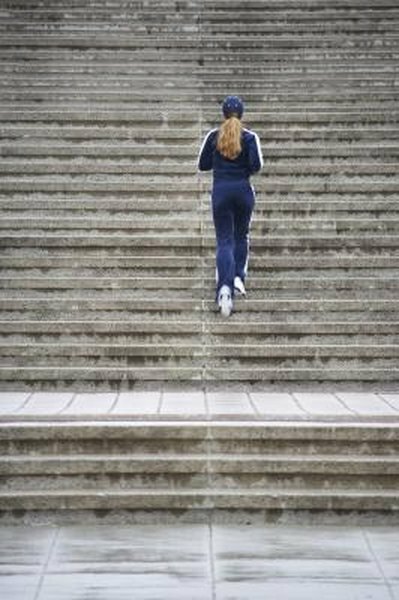 Soreness after a challenging activity like stair climbing is normal, although pain in your muscles can signal a strain. Most minor strains benefit from immediate rest, as well as an ice pack on the area of soreness three times daily for about 20 minutes. Reduce swelling by elevating your foot and wrapping your sore muscle with a compression bandage. Alert your doctor if your muscle discomfort lasts past a week or shows swelling and redness -- common signs of infection. Although stair climbing is a proven exercise to reduce your weight, obtain your doctor’s permission before attempting the activity. Stair climbing machines featured at most fitness centers offer a strenuous workout even when performed on the lowest settings. Stair climbing subjects your body to twice the demand as a normal walk and typically results in exhaustion at a significantly faster rate. Consider limiting yourself to only a few minutes of climbing until your endurance allows more.